Sixteenth and Martha streets, Omaha, in 1915 doesn't seem to have anything in common with the Olympic games of Greece, 700 years before Christ. Still less with Hercules, hero of Greek mythology, whose life is merged in the mists of prehistoric times. But there is a close connection. 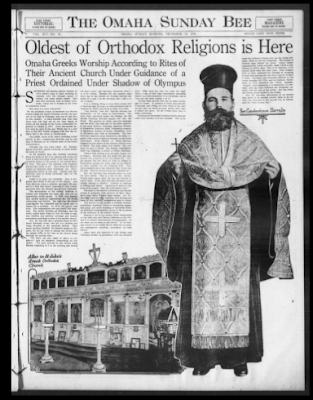 On the southeast corner of Sixteenth and Martha streets stands the Greek Orthodox church, the only one of its kind in Nebraska, and one of only five in the country. A black-bearded man with long black hair was sent out by the Holy Synod of Greece at the request of the Greek communion organized in Omaha in 1907. From his ancient native land he came to the new World and to a new part of the New World, bringing with him the religion that is the oldest in Christendom. The priest, rector of St. John's Orthodox Greek church, is Rev. Constantinos Harvalis, and he was born in Olympia on the western coast of the Greek Peloponnesus. Olympia, the very town where the Olympic games were first played, hundreds of years before the birth of Christ! In his boyhood days this Omahan wandered along the banks of the river Alpheus and among the ruins of that level plain where, 2,500 years ago, his ancestors played at the games in the sacred grove of Altis. This grove was adorned with exquisite statues and works of art. Here stood the famous temple of Olympian Zeus containing the chryselephantine statue of that god. Legend told that Hercules, here of Greek mythology, laid out the grove himself. Today it is ruins and cornfields. Zeus is forgotten and Christ is the god of the Greeks. And from Olympia comes a minister to preach His gospel in a land that wasn't dreamed of until twenty centuries after the Olympic games were instituted. The descendants of the ancient Hellenes in Omaha and Nebraska are many and they are an industrious, thrifty people. In 1907, they decided they needed spiritual organization and the Greek communion was formed. The next year the Greek congregation was organized and an appeal sent to Greece for a minister. In 1910, the church was built. The congregation now has nearly 500 members. The parish includes all Nebraska, and the rector makes many trips out into the state to baptize children and perform marriage and funeral ceremonies according to rites of the ancient church. Rev. Mr. Harvalis has a pleasant home at 1907 South Sixteenth street, and his five children are being educated in the American fashion. They speak excellent English. He himself speaks no English, for all his work is among the Greeks and he spends much of his time at the church going through the ancient rites. "We don't use any organ or piano in our church," said his daughter, interpreting for her father. "We have services in the church every Sunday beginning at 8 in the morning and lasting till about noon; also Saturday afternoon, from 5 to 6:30 o'clock. Besides this the minister goes every day to the church for worship between the houses of 6 and 7 in the morning and 7 and 8 in the evening." It is a striking thing to hear these people talk of Socrates and Lycurges as their ancestors and to mention St. Paul's preaching in their own cities. "Our church," said Rev. Harvalis through his interpreter, "is the oldest in Christendom. The Jews were converted before the Greeks, but the Jewish Christian churches passed over into the Greek. The apostles of Christ used our language and the Greek was used also by the great majority of the early fathers - Polycarp, Ignatius, Clement of Alexandria, Eusebius, Basil, Athanasius, Gregory of Nazianzen, Gregory of Nyssa, Chrysostom, Cyril of Jerusalem and Cyril of Alexandria. The first Christian emperors, from Constantine the Great, together with a host of martyrs belonged to the Greek communion. Each Clement of Rome, Hermas, Hoppolytus and others of the western church wrote in Greek. The early popes were Greeks. The very name of pope is Greek. The Roman congregation itself was originally a colony of Greek Christians. "Paul's first journey from his own country was to Greece. Socrates had laid down the law that anyone who preached a new god should die. Paul got around this law when he came to Athens by discovering among the many gods of the Greeks an altar marked 'To the Unknown God.' Paul then preached about the unknown God, which was his God. Thus he did not break the Athenian law." Rev. Mr. Harvalis was married before he took his holy orders. This is a law of the church. Priests must marry once, but are not allowed to marry twice. If the first wife dies the priest must remain forever a widower. Celibacy is confined to bishops and monks. Absolution is given in the form of the prayer, "May the Lord absolve thee." The altar of the church at Sixteenth and Martha streets is gorgeous with pictures of Saint Mary, Saint John, Saint William, Saint George. Rev. M. Harvalis' robes of office are long, full, flowing and made of rich material, embroidered gold in colors. The service in the church is strongly oriental, symbolic, mythical. There is fascinating display and pomp, and much changing of sacerdotal dress. An elaborate ceremonialism marks it, far in excess of the ceremony in the Roman church. Singing is led by two singers, Peter Dimmoulias on the right side and Thomas Maharas on the left, and it is without instrumental accompaniment. As yet there are no seats in the church. In the Russian branch of the Greek church there are no seats, the congregation standing throughout the long service. Many fasts are observed by the Omaha and Nebraska Greeks, in accordance with the church's laws. They have not only one Lent, but four. There is one of fifty days immediately preceding Easter, one from November 15 to Christmas, one in June and one from August 1 to 15. During these periods they eat no meat, butter, eggs or cheese. In addition to these long periods, Wednesday and Friday of every week in the year are fast days, on which no meat, butter, milk, eggs or cheese are eaten. So the Greeks come near to being vegitarians. Christmas in the Greek Orthodox church does not come until January 6 of our calendar. This is because the orthodox Greeks still use the Julian calendar, while we use the Gregorian. The former is thirteen days behind the latter. Julius Caesar originated the Julian calendar, under which a year consists of 365 1/4 days. This is 11 minutes, 13.95 seconds more that the solar year. Pope Gregory XIII, in 1582, reformed the calendar by dropping ten days and making the rule for a year as we have it today. Germany and Denmark adhered to the Julian calendar till 1700, and in England, Parliament, in 1752, abolished the Julian calendar, 'skipped' from September 2 and September 14 overnight, and has since followed the Gregorian calendar with the rest of the world. But the orthodox Greek church sticks to the Julian. Rev. Mr. Harvalis, descendant of an ancient line, priest of an ancient church, born in an ancient city, educated in the ancient city of Athens, say he "likes Omaha fine."